In response to overcrowding at the main Buddhist Secondary School in the town center of Luang Prabang (1,300 students working in 8 crowded classrooms, classes in 3 shifts per day), Pha One Keo Sitthivong, Director of the Buddhist Secondary School and Founder of the Buddhist Academy site, began teaching lower secondary school students at Vat Pa Pha-O, the Buddhist Academy. Classes were initially taught in challenging conditions, outdoors or under awnings with inadequate desks and seating and few aids for the teachers. The Buddhist Heritage Project worked with the Sangha to develop plans for new classroom construction at the Academy site. With major support from the London based Badur Foundation and numerous local and international private donors, in 2012 we completed the first classroom building. Two more substantial classroom buildings have followed, the last being completed in 2015. 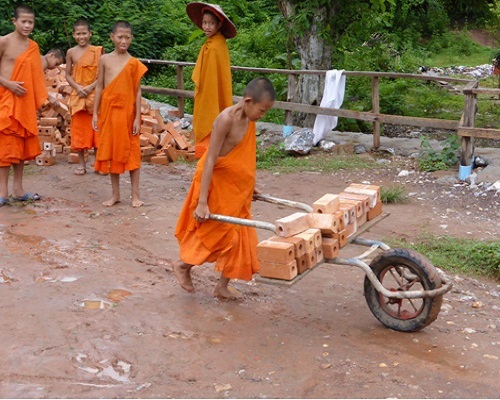 The monks and novices themselves made significant contributions to the manual labor in construction of all three buildings, working long days on the construction when not actually in classes. 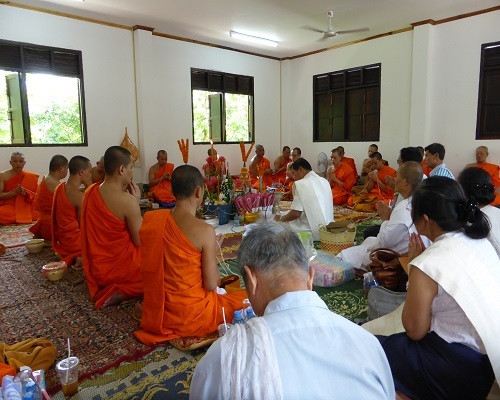 The Buddhist Secondary School at Vat Pa Pha-O has its own accreditation from the Department of Education and has been nominated as the principal Buddhist Secondary School for students from the northern part of Luang Prabang province. Most of the students are the children of impoverished rural subsistence farmers who were not able to afford to send their children to the public schools. 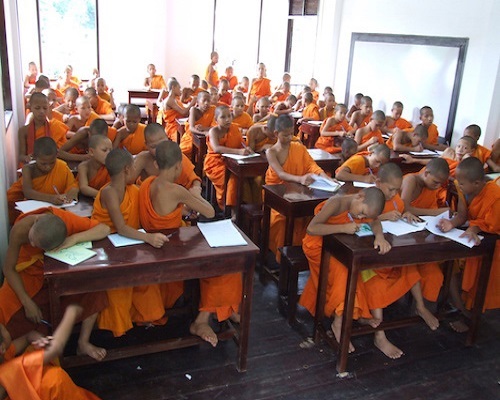 At the Buddhist schools the students receive a broad general education in addition to Buddhist studies; they have safe, dry sleeping quarters and receive typical monastery meals every day, all in the embrace of an harmonious, protective environment. To see the 350 students at the Secondary School at Vat Pa Pha-O engaged with enthusiasm in their studies and pride in their environment is one of the most satisfactory validations of the Buddhist Heritage Project's initiatives. 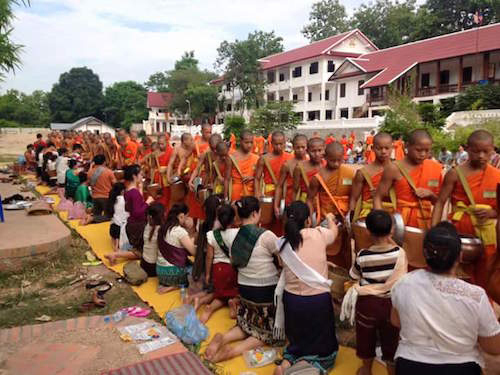 During a morning Tak Bat, or Alms round, as part of the opening ceremonies of the new Secondary School buildings, novice students receive offerings from the assembled lay people. 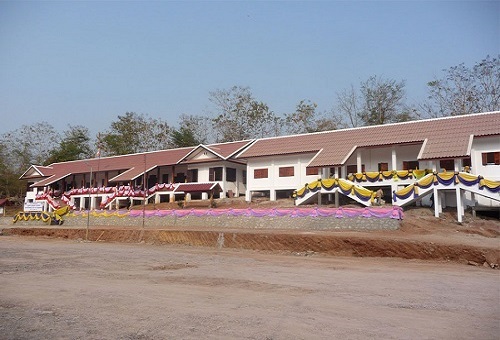 The third and final Secondary School building just prior to the beginning of an important ceremony to celebrate the completion of construction. On the very first day of classes in the new school building, excited students jostle for position at the desks and busy themselves with the first lession of the day. The novice students eagerly line up as Buddhist Heritage Project staff and out personal copies of the new school book on Ceremonies and Rituals by Hans Georg Berger, entitled "Thank You for Looking". Although the pratice of Walking Meditation is most commonly taught during the Vipassana meditation retreats, students at the Secondary school are ocasionally given instruction. 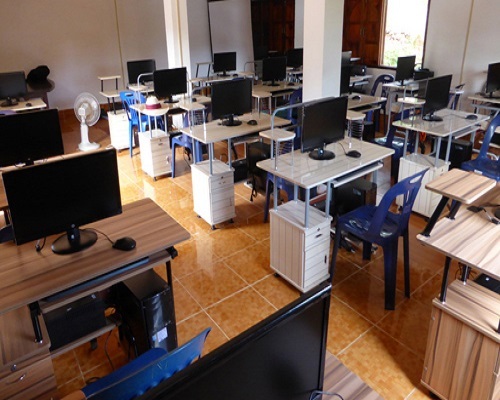 The newly constructed classroom in the Information Technology training center at the Buddhist Secondary School. Students are instructed in basic computer skills and computer maintenance, as well as productivity skills in programs such as MS Word and Excel.